The Scottish-European Growth Co-Investment Programme is a GBP 100 million equity co-investment scheme managed by EIF, to be invested alongside private investors with the objective to catalyse at least another GBP 100 million of growth capital to target companies. It is a joint initiative by EIF and Scottish Enterprise, which contribute a financial allocation of GBP 50 million each. The Scottish-European Growth Co-Investment Programme was launched in June 2017. The objective of Scottish-European Growth Co-Investment Programme is to support Scottish SMEs and to attract international private equity investment to Scotland, by providing co-investment funding alongside equity investment funds and private investors on market terms. It will focus mainly on the "second equity gap” that companies face when they move beyond the start-up stage and into the growth phase of their lifecycles. Start-up companies are also eligible for finance. The Scottish-European Growth Co-Investment Programme is the first part of the Scottish Growth Scheme, a GBP 500 million financial package, backed by the Scottish Government, to help Scottish businesses thrive and grow. It is one of the first financing programmes launched by EIF under the EIF-NPI Equity Platform and the Investment Plan for Europe in cooperation with EU National Promotional Institutions. Scottish Enterprise became a founding member of the EIF-NPI Equity Platform’s General Forum in September 2016. 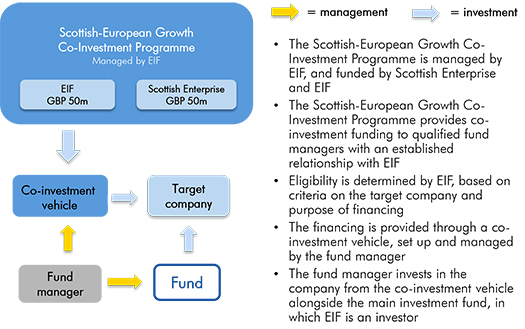 How does the Scottish European Co-Investment Fund work? EIF will manage and deploy the Scottish-European Growth Co-Investment Programme through co-investments into companies alongside investment funds in EIF's portfolio, a list of which can be found here. Scottish Enterprise is available to provide support to companies in identifying appropriate fund managers to approach, and in preparing their investment propositions. The co-investment can be made both into new and existing portfolio companies of such investment funds. The co-investment capital will be provided through a co-investment vehicle, which is set up and managed by the fund manager. The fund manager will invest in the target company from the co-investment vehicle alongside an investment from the main investment fund. The size of investment will be assessed in each case. There are no pre-defined maximum or minimum amounts. Interested fund managers should submit to EIF a co-investment proposal targeting an identified target company through their existing EIF relationships or contact EIF for further information. Should the investment proposal meet the criteria listed below, EIF will conduct an initial screening to determine eligibility before proceeding. Are you a fund manager interested in partnering with us under the Scottish European Co-Investment Fund? are proposing a co-investment in a new or existing portfolio company of their investment fund, in which EIF is an existing investor. What are pre-defined eligibility criteria for the target companies? demonstrate strong growth and export potential, with a clear path to increase in turnover, profit or employment. include among its objectives the growth of the company’s Scottish operational trading base. Additional criteria may apply, and will be provided by EIF upon review of the co-investment proposal.